Recipes for the Rude Health/Virtuous Bread baking competition! Hi! Here are some recipe ideas for our baking competition. Don't know about the competition? Click here to read all about it! 1. Put the Rude Health Morning Glory porridge in a bowl and mix it together with 50 mls of boiling water, the vegetable oil or butter, and the salt. Give it a good stir and leave it there while you put everything else together. 2. In a separate bowl, put the flour and the yeast and blend them well with. Add 300 mls of luke warm water and the porridge mixture. Stir this until it gets too stiff and then turn it out onto a floured work surface and knead it well for 10 minutes. The dough should be quite sticky. Just keep scraping it off your hands and give it some welly. It will become more elastic as you knead. After ten minutes of good kneading, pop the dough back in the bowl and cover it with a tea towel. Leave it for about an hour or until it has doubled in size. 3. Pull it out of the bowl and onto the work surface again and squash it down to expel the air. If you are making two loaves, divide the dough in two and shape them into sausages, roll them in some Rude Health Morning Glory porridge and put them into two bread tins which you have buttered well. 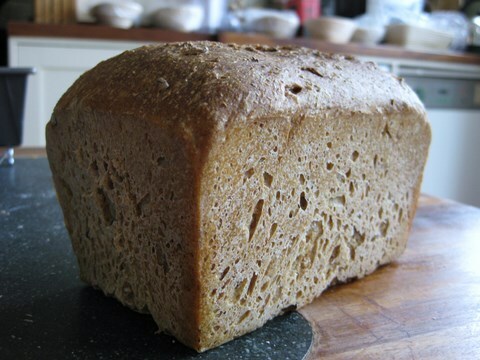 If you are making one loaf, shape the dough into a sausage, roll it in some Rude Health Morning Glory porridge and put it into a well buttered bread tin. Cover the dough with the tea towel and let it sit for 45 minutes or until it has doubled in size. Whether you are making one loaf or two, the dough should only fill the tin 2/3 full. 4. Pre heat the oven to 200 degrees centigrade and when it is ready, slash the loaves in one cut from head to toe and put them in the oven. If you are baking two small loaves, leave them in for 45 minutes. If you are making one big loaf, leave it in for 50 minutes. 5. Let it cool for a bit on a wire rack and then eat with lashings of butter. This bread is particularly good with cheese and is great toasted. 1. The night before you want the hot, fresh bread for breakfast, pour the granola in a big mixing bowl, cover it with the milk and let it sit on the counter top all night. It will go sour and that is the point! 2. In the morning, set the oven to 230 degrees centigrade. 3. Add the rest of the ingredients to the granola and milk mixture and give it a good stir. It will be stiff and sticky. 4. Spoon it into a “one pound” (smallish) bread tin that is well greased with butter. With wet fingers push it down and smooth it as best you can. 5. Make a “channel” down the middle of the dough with a knife. You won’t be able to cut it because it is too gloopy but use a knife to make an incision about 1 cm deep and then gently press the incision apart so you have a channel about ½ a centimeter wide down the length of the dough. You do this so it won’t split while it is baking. 6. Pop it in the oven for 10 minutes. Then, turn the oven down to 200 and bake it for another 20 minutes. 7. Turn it out and let it cool on a wire rack or it will fall apart as you cut it. 8. Smother it with butter and the topping of your choice (we like honey) and devour. Yum.